It’s winter in the Great lakes, which means good steelhead fishing can be found in most of our tributaries. We’ve been blessed with mild weather the last few winters, which presents great fishing opportunities. While many anglers use an array of baits, BorX O Fire cured steelhead spawn sacks proves to be my most productive bait. Whether targeting Lake Superior, Huron, Michigan, Erie or Ontario tributaries, this cure recipe and bait tying technique is effective. I prefer BorX O Fire for several reasons, but most notably, it doesn’t burn your eggs, it adds scent and preserves them. I can drift these eggs until I get a bit without worrying about them losing their color. If I was using fresh spawn I only get a handful of drifts before having to switch out baits. 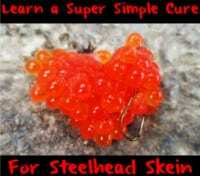 Let’s now focus on how to cure steelhead eggs. Most important is to start with a good egg. If you don’t even the best cure won’t yield quality eggs. This means the fish needs to be completely bled. 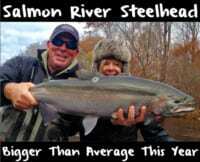 When you catch a female steelhead, you’ll want to cut every gill and place the fish on a stringer in the river current for at least an hour. I even like to massage the belly of the fish, which will ensure every bit of blood is out. If there is any blood left in the fish, the eggs will absorb it. This causes a dark, unnatural color in the eggs. They also wash out faster and won’t preserve for nearly as long. Steelheading is a “game of inches” which means these small details important. Remove the eggs from the fish and then scrape the eggs free of the membrane while using a plastic spoon. You want to make sure most of the membrane is removed from the eggs. If there’s any chunks of membrane in your eggs they turn white fast resulting in spawn bags that won’t fish as long. When scraping eggs I start from the tail end of the skein and migrate towards the top while using short, gentle strokes. The goal is to have clean, loose eggs. Add BorX O Fire to your eggs. It’s important to roll them around so the cure is evenly spread. Make sure you use enough to cover all your eggs. While many anglers opt for Natural and Orange BorX O Fire in the Great Lakes, I like to use pink, too. Your eggs are now ready to be tied into spawn bags. If you’re not going to fish the eggs within a week, I vacuum seal and freeze them. Otherwise, I tie them and keep them in the fridge. During the winter months, I’ll like to tie dime-size spawn bags or smaller. When temperatures are cold, fish become lethargic. I’ve found the smaller presentation is best. White, chartreuse and pink netting are my most productive colors. Meanwhile, there are times when I’ll fish blue in clear water or other colors such as peach, red, orange and yellow. Steelhead can be picky on the size and color of bait. It’s important to bring a variety to the river. You can never have to many options. Lay out netting squares on a flat surface. For winter steelhead I add a dozen steelhead eggs to each piece of netting. During the winter the eggs in the fish won’t be as mature, so you’ll need about a dozen to achieve a dime sized spawn bag. As the season progresses and the eggs develop more you can use less to achieve the same size. Pinch each corner of the netting and gently twist the netting so the bag of eggs is snug. Not tight, but snug. Once you wrap thread, your bag becomes tight. Take your thread and wrap the spawn bag shut. To do this, simply wrap the thread three times and pull it snug. Then, wrap three more times and pull it snug until the thread breaks. The best thread to use is Magic Thread. However, most any fly tying or sewing thread will work. Simply snip the excess netting and thread just above the knot. I like to make sure I remove all excess netting and thread as possible. They are now ready to fish. This cure process and bait tying technique is effective on steelhead system in the Great Lakes. If you follow these steps – and start with a good egg- expect epic eggs that you can drift for 30 minutes without losing color. If you’re a beginner, it may take practice, but the results of fishing this bait are incomparable! Editor’s Note: Kyle McClelland operates XXL Chrome Chasing. For more info please visit https://www.facebook.com/XxlChromeChasing.